Charlotte owns a chic Birmingham bridal boutique. Dressing brides for their big day is her gift . . . and her passion. 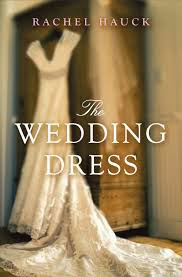 But with her own wedding day approaching, why can't she find the perfect dress...or feel certain she should marry Tim? Charlotte's search for the gown's history-and its new bride-begins as a distraction from her sputtering love life. But it takes on a life of its own as she comes to know the women who have worn the dress. Emily from 1912. Mary Grace from 1939. Hillary from 1968. Each with her own story of promise, pain, and destiny. And each with something unique to share. For woven within the threads of the beautiful hundred-year-old gown is the truth about Charlotte's heritage, the power of courage and faith, and the timeless beauty of finding true love. Charlotte is has a wedding dress boutique and she's great at matching the perfect dress to the perfect girl. When she can't find a wedding dress for her own upcoming nuptials, she begins to question her own relationship. While at an auction she feels compelled to build on an old trunk which has interesting contents. To distract herself from her own relationship she becomes fascinated with finding the owner of the beautiful trunk and the dress inside. Meanwhile the reader gets insight into the lives of the previous owner of the dress. I rushed to get this audio from my library after reading a review from Juju from Tales of Whimsy and I really enjoyed this audio. The story is interesting and compelling. I loved the realism of Charlotte and Tim's relationship. Charlotte seemed mature without being perfect. Also the mystery involving the wedding dress kept my interest from beginning to the end. It has an air of magical realism and I loved the stories of the other women though some were sad. Miss Pappageorge did a good job. All the characters were easily discernible. The accents were believable and all the voices were easy to listen to. I'm so glad I read Juju's review because this was a solid enjoyable read that had me reflecting on life right along with Charlotte. It was so pleasant. And I don't mean that to make it less than it was. It was really good but it felt pleasant. YAYYYYYYYY! I got so excited when I saw this title in my reader. I'm so glad you liked it. Thank you for the shout out too. *hug* I get happy when I recommend something and someone likes it. You're right. It did have an air of magical realism. I do love magical realism. Didn't you wish you could search the web for a sketch of the dress? Sounds really good! I think you got me at Wedding Dress Boutique!! I love all wedding related stuff, though I'm not very keen on relationships lol. I hadn't planned on looking for my wedding dress until later in the year but my friend and I chatted to the kimidress team at Man City and before I knew it I was trying on a dress. It wasn't what I would have picked out but after an appraisal of my figure it was suggested as the best option. They were right - it looked wonderful but I didn't have the nerve to commit to it without trying on a few more so I made an appointment to visit the store with my Mum. During the shop visit I had the chance to try others but nothing came close so I placed my order. I had no idea of what I wanted or what would and wouldn't suit me so being looked after by someone who knew their business and what suits which body shape was a huge bonus and made the process less daunting. I felt like they cared about how I felt and genuinely enjoy and care about what they do. A ball gown is a flattering wedding option for many women. The gowns tend to emphasize the best parts of a woman and hide the ones you are not eager to show. A full skirt can be very flattering and minimize hips or thighs if needed. A ball gown can also be flattering on tall and slender women. These dresses can work on practically anyone.see for more kimidress.co.uk!! For dramatic effect, choose Cheap Wedding Gowns that exposes your back elegantly to turn heads around. Black dress is a perfect chic go-to dress for a gorgeous look with little effort. Red dress, pink dress, white dress etc are equally a perfect choice for a classic look. Wearing an elegant backless Discount Prom Dress 2014 will earn you lots of admiring comments. Dress with a proper fit will make you feel confident and beautiful. Backless style will surely do justice to you as you enter the room. This style looks more elegant on full-length Designer Wedding Dress but if short dress is your choice then also no problem. For exposing more in short dress you must keep your shoes and accessories appropriate enough to avoid a trashy look. Women having beautiful legs for a spectacular appearance should wear short length backless dresses..
Hairstyle also matters a most in this style. If you have short hairs it doesn't matter whatever style you make. But if you have long hairs, keep certain things in mind.